News from St. Petersburg, Florida today, as the city officially opens its Dalí Museum. HOK makes a serious departure here — mutating Buckminster Fuller’s geodesic geometries and fabricating each discrete piece – after the jump. The location – directly in the path of hurricanes – may seem like a counterintuitive choice for a museum housing hundreds of rare works by the famed Surrealist. But the risk inherent in storing anything of value in Florida actually informed some of the more remarkable aspects of the design. For example: the Museum’s precast concrete walls are 18 inches thick (the roof is 12″), and all of the work is housed on the 3rd floors – allowing the 75′-high interior atrium to become an open space for the architects to engage visitors moving upwards into the galleries. So, what did they decide to do with that open space? 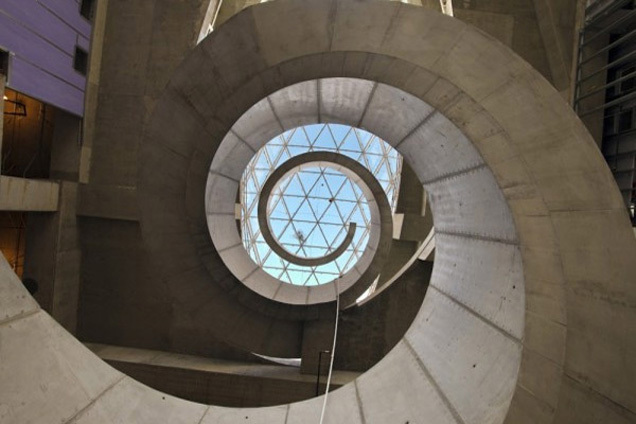 Check out the massive spiral concrete stair below – based on both the Fibonacci sequence and the double-helix DNA pattern that Dalí was purportedly quite interested in. As you can see, the concrete stair seems to float, or hang, from the ceiling – and your visual instincts to think so would be right! The entire stair core is actually in tension, held in place at its two ends. The exterior of the Museum is also based on a set of tensions inherent in Dalí’s work – most importantly, the tension between rationality and surrealism. It turns out, interestingly, that he was also quite interested in Buckminster Fuller – and the organic form oozing out of the rational pre-cast facade is a take off on Fuller’s geodesic structures. Of course, HOK was able to mutate Fuller’s geometries considerably using contemporary fabrication techniques – each piece (of 1,000) is unique, and was assembled according to a set of color codes.